U.S. Rep. Cathy McMorris Rodgers, R-Wash., is pushing legislation that would revive a 2014 salmon-and-dams plan previously struck down by a federal judge, and nix court-ordered spills at dams on the Snake and Columbia rivers. If passed and signed into law, it would make the government's latest plan - which attempts to reconcile operation of the dams with the needs of threatened and endangered fish - valid through 2022. Known as a biological opinion, the existing plan was completed in 2014 and set aside last year by U.S. District Judge Michael Simon at Portland, Ore. At the time, Simon chastised officials at the National Marine Fisheries Service, U.S. Army Corps of Engineers and Bonneville Power Administration for failing to come up with a plan that better meets the needs of wild salmon and steelhead. 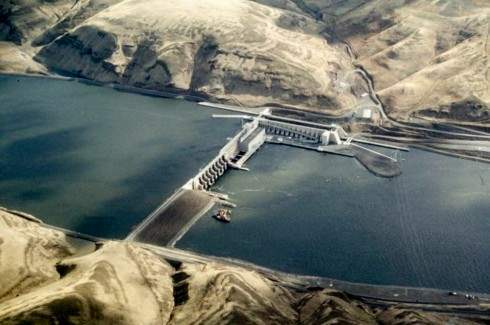 "The Federal Columbia River Power System remains a system that 'cries out' for a new approach and for new thinking if wild Pacific salmon and steelhead, which have been in these waters since well before the arrival of Homo sapiens, are to have any reasonable chance of surviving their encounter with modern man," Simon wrote at the time. Instead of a new approach, the legislation co-sponsored by Republicans Jaime Herrera Beutler and Dan Newhouse of Washington and Greg Walden of Oregon, along with Oregon Democrat Kurt Schrader, would lock the 2014 plan in place and eliminate a 2018 deadline to replace it. The new bill also mandates that nothing that could restrict electrical generation at any of the dams or navigation on the Snake River be implemented without the consent of Congress. That provision would seem to block Simon's order earlier this year that additional water be spilled at the dams starting next spring to help juvenile salmon and salmon survive their annual migration to the Pacific Ocean. In a news release, McMorris Rodgers, who has served as chairwoman of the Republican caucus since 2013, said the bill would help keep energy prices low. "Hydropower provides 70 percent of our energy in Washington state - much of which is produced on the Federal Columbia River Power System," she said. "The (system) ensures people in eastern Washington have access to clean, renewable, reliable and affordable energy every single day - all while achieving record fish returns. There is still work to be done, but dams and fish can coexist, and the (system) proves that." Salmon advocates said the bill is an attempt to circumvent the law and to wipe out proven techniques that have boosted salmon survival rates. "The clear purpose is to prevent the implementation of the court's spill injunction. Although the bill doesn't say that and the press release doesn't say that," said Todd True, an attorney with the environmental law firm EarthJustice at Seattle. "So there is a big effort here to hide the ball and that is unfortunate." True said the spill-blocking provision appears to go even further. Simon ordered the federal government to write an intensive environmental impact statement on the dams under the provisions of the National Environmental Policy Act. That effort, which is scheduled to wrap up in 2022, is likely to include a number of potential alternatives that might help the fish. But True said the bill forbids even the study of actions like dam breaching or additional spill that could lead to reduced energy output or navigation. "This is a wolf in sheep's clothing," he said. "It looks like it is aimed at short-circuiting the (EIS) process the court has ordered." Supporters of the dams said the bill, by eliminating the need to write a new biological opinion by the end of next year, gives federal scientists more time to concentrate on the environmental impact statement. The lessons learned from that effort, they say, will help shape a biological opinion for 2022 and beyond. "I think it makes sense to say 'let's get the (National EIS) process done first and have the benefit of that information to develop a new biological opinion instead of trying to develop one in 2018,'" said Terry Flores, executive director of Northwest River Partners.
. . . SEC. 4. LIMITATION ON RESTRICTING FCRPS ELECTRICAL GENERATION OR NAVIGATION ON THE SNAKE RIVER. No structural modification, action, study, or engineering plan that restricts electrical generation at any Federal Columbia Power System hydroelectric dam, or that limits navigation on the Snake River in the State of Washington, Oregon, or Idaho, shall proceed unless such proposal is specifically and expressly authorized by an Act of Congress enacted after the date of submission to Congress of a proposal for such modification, action, study, or engineering plan, respectively.